As engineers make strides in the design of wearable, electronically active, and responsive leg braces, arm supports, and full-body suits, collectively known as exoskeletons, researchers at MIT are raising an important question: While these Iron Man-like appendages may amp up a person’s strength, mobility, and endurance, what effect might they have on attention and decision making? The question is far from trivial, as exoskeletons are currently being designed and tested for use on the battlefield, where U.S. soldiers are expected to perform focused tactical maneuvers while typically carrying 60 to 100 pounds of equipment. 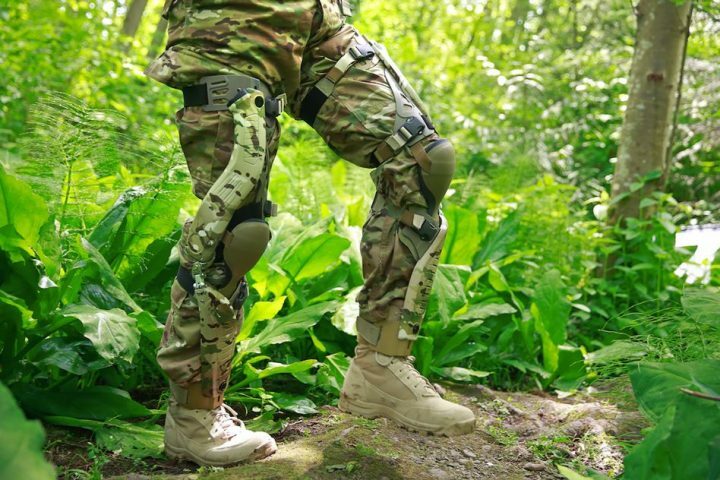 Exoskeletons such as electronically adaptive hip, knee, and leg braces could bear a significant portion of a soldier’s load, freeing them up to move faster and with more agility. But could wearing such bionic add-ons, and adjusting to their movements, take away some of the attention needed for cognitive tasks, such as spotting an enemy, relaying a message, or following a squadron? The answer, the MIT team found, is yes, at least in some scenarios. In a study that they are presenting this week at the Human Factors and Ergonomics Society Annual Meeting in Philadelphia, the researchers tested volunteers, who were either active-duty members of the military or participants in a Reserve Officer Training Corps (ROTC) unit, as they marched through an obstacle course while wearing a commercially available knee exoskeleton and carrying a backpack weighing up to 80 pounds. Seven of the 12 subjects had slower reaction times in a visual task when they completed the course with the exoskeleton on and powered, compared to when they finished it without the exoskeleton. The researchers also found that the soldiers, when asked to follow a leader at a certain distance, were less able to keep a constant distance while wearing the exoskeleton. The results, though preliminary, suggest that engineers designing exoskeletons for military and other uses may want to consider a device’s “cognitive fit” — how much of a user’s attention or decision making the device could potentially divert even while assisting them physically. Stirling’s co-authors on the paper include researchers at MIT, Draper, and the University of Massachusetts at Lowell. To investigate exoskeletons’ effect on a user’s attention, the team set up an obstacle course at UMass Lowell’s NERVE Center, a facility that normally tests and evaluates robots over various physical courses. Stirling and her colleagues modified an existing obstacle course to include cross-slopes and short walls to step over. Lights at both ends of the obstacle course were set up to intermittently blink on and off. The team enlisted 12 male subjects and trained them over a period of three days. During the first day, they were each custom-fit with, and trained to use, a commercially available knee exoskeleton — a rigid, powered knee brace designed to help extend a user’s leg and increase endurance while, for example, in climbing over obstacles and walking over long distances. Over the following two days, the subjects were instructed to navigate the obstacle course while following a researcher, posing as a squadron member. As they made their way through the course, the subjects performed several cognitive tasks. The first was a visual task, in which the subjects had to press a button on a mock rifle as soon as they perceived a light go on. The second was a pair of audio tasks, in which the subjects had to respond to a radio call check with a simple “Roger, over,” as well as a more complicated task, where they had to listen to three leaders reporting different numbers of enemies and then report the total number over the radio. The third was a follow-along task, where the subjects had to maintain a certain distance from the squadron leader as they navigated the course. Overall, Stirling found that for the visual task, seven of the 12 subjects wearing the powered exoskeleton reacted significantly more slowly and tended to miss light signals completely, compared with their performance when not wearing the device. While wearing the powered knee-brace, the subjects also had a harder time maintaining the specified distance when following the leader. Going forward, Stirling plans to investigate the importance of reaction times while wearing an exoskeleton in various contexts. Interestingly, the team identified a few users who were unfazed by the addition of an exoskeleton, and who performed just as well in the visual, audio, and follow-along tasks. Stirling’s group is working toward a better understanding of the way humans adapt and react to exoskeletons and other wearable technologies, such as next-generation spacesuits. Beyond military and space applications, Stirling says that if the connection between the human and the machine can be made more fluid, requiring less of a user’s immediate attention, then exoskeletons may find a much wider, commercial appeal. “Maybe you want to be able to climb that mountain, or go on a longer hike, or you may be older and want to run around with your grandkids,” Stirling says. This research was supported, in part, by Draper. *Originally published in MIT News.